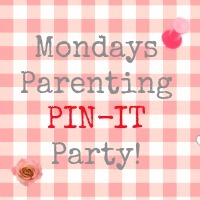 Welcome to the Monday Parenting Pin-It Party, an all new, pin-tastic linky. This linky is all about sharing your parenting posts and finding lots of other cool stuff to pin and boards to follow on Pinterest, whilst gaining some new followers yourself to share more of your own awesome stuff with. Each entry will be pinned to the Parenting Pin It Party board by the host. The following weeks host will then feature their two favourite pins from that week in the next Monday Parenting Pin-It Party post, so don’t forget to follow the blog of each host so that you don’t miss out. It might be you. So who are the hosts? This linky opens each Monday and remains open all week and you can even subscribe to our mailing list if you would like us to send you a reminder each week. You can also join in the conversation on Google + with us here so do add us to your circles.